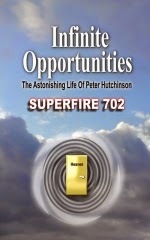 The new powerful book ‘Infinite Opportunities’ written by the man behind Superfire 702 is a short incredible biography. His life experiences were far from normal with totally unexpected outcomes. The traumatic life of Peter Hutchinson is a demonstration that a person can make it through very stressful and depressing times and learn from what took place. Out of all the four books he has written, ‘Infinite Opportunities’ is the first book priced at $9.99 that has been bought by re-sellers who posted the book back on Amazon for over $25. Even though the ebook version was priced cheaper, Amazon has priced it higher than the listed value. When you read it you will realise that this book is like a supernatural blockbuster movie. See for yourself about this astonishing life before Amazon raises the price. ‘Infinite Opportunities’ was published in June 2014.